October 2018 – After the end of a 22-year civil war, the Nuba Mountains in Sudan remained a conflict zone. Providing critically-needed health services in this remote, challenging region - home to a population of 1.6 million - is difficult and at times, impossible. The resolve of Dr. Tom Catena, the only doctor at the only hospital (Mother of Mercy Hospital) serving this area is resolute and inspiring. When the fighting escalates, Dr. Catena and the staff of the hospital in South Kordofan remain in place, even as NGOs and people flee. About four years ago, Medicines for Humanity (MFH) began collaborating with the hospital and its staff to establish additional health services in the communities to provide preventive and curative care and reach more people. Since then, together with the hospital’s Community Outreach Team, MMH and MFH have re-opened and staffed six health clinics in outlying areas, serving more than 90,000 people. 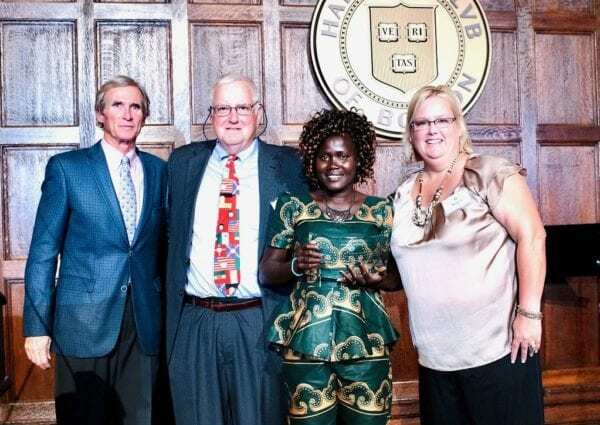 Medicines for Humanity, recently presented its 2018 Humanitarian of the Year Award to Dr. Tom Catena and the Community Outreach Team of the Mother of Mercy Hospital in South Kordofan, Sudan for their extraordinary commitment and service to saving lives in the Nuba Mountain region. The presentation was made during the annual MFH Humanitarian Awards Dinner held at the Harvard Club in Boston. Accepting the award was Dr. Catena’s wife, Nasima Catena, who is a registered nurse and a member of the MMH hospital staff. To learn more about life in the Nuba Mountains and our project there, watch the video below! L to R: MFH Board Member and Dinner Chair Thomas M. O'Neill, MFH Founder and Board Chair Tim Bilodeau, Mrs. Nasima Catena (accepting the award) and MFH Executive Director, Margaret Brawley.